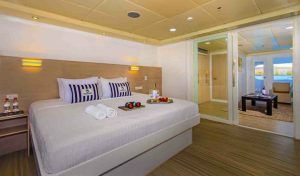 Accomodation on Treasure of Galapagos consist of 1 Ocean view Master suite king size bed with 2 private balconies, 2 Ocean view Junior matrimonial suites queen size bed with private balcony, 6 Ocean view Junior twin suites with private balcony, private bathroom, hot water, air conditioner, security box. Day 1 FRIDAY: Transfer in Baltra – Seymour Port . PM: Lunch at noon. Transfer to Puerto Ayora dry landing, hiking educational visit to the Charles Darwin Station (giant tortoises, Opuntia cactus, etc.). Degree of difficulty: easy Duration: 2 hours, dinner at night. 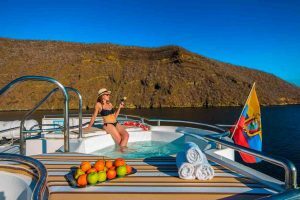 Day 2 SATURDAY: Sullivan Bay and Bartolome AM: Sullivan Bay:Breakfast in the morning.This site is of great geological interest is located south-east of Santiago Island, landing it can be done both on the rocky shore (dry landing) or the white sandy beach (wet landing). The length of the trail is 1.5 km approximately. The area is covered by lava flows Pahohoe type (solidified lava in a wavy or accordion). It was very active in the past 25 years of the nineteenth century. The Sullivan lava was formed in 1897. Flow is very young geologically. The magma formed is flat, but the underground lava movement, rapid cooling and other eruptions led to the break in many places. Difficulty: Moderate Duration approximately 1 hour 30 minutes. Lunch at noon. PM: Bartolomé: Wet Landing, After lunch visit to the Pinnacle Rock beach for swimming and snorkeling. In the afternoon dry landing to reach the viewpoint of Bartolome. On this island, you can see interesting formations of lava and cinder cones. After a 30 to 40 minutes climbing, a wooden staircase leads to the top of the island where there are beautiful views of the nearby beaches. This island is one of the most visited and photographed because of Pinnacle Rock. Degree of difficulty: Moderate, Duration 1 Hour 30 Minutes. Dinner in the evening. Day 3 SUNDAY: North Seymour – Mosquera AM: North Seymour: Breakfast in the morning. Dry landing. 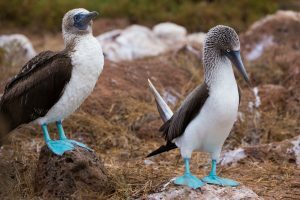 On this island you can see blue-footed boobies, colonies of frigates, fork-tailed gulls, terns, sea lions, lava lizards and land iguanas. Palo Santo trees can also be observed. Difficulty: Moderate Duration approximately 2 hours. Lunch at noon. PM: Mosquera: Wet Landing. The Islet is Located between the islands of Baltra and North Seymour.It is a reef of rocks and coral (the result of an uprising) and a great white sand beach. It is a reef of rocks and coral (the result of an uprising) and a great white sand beach.Its narrowest width reaches about 160 meters and has an estimated length of 600 meters.In most of the perimeter there is base of lava rocks, as evidence of the lava uprising, except in the southwest side where the landing occurs.In most of its perimeter there is basis of lava rocks, as evidence of the wash uprising, except in the southwest side where the landing occurs.This island has one of the largest populations of sea lions. This island has one of the largest Populations of sea lions.You can also observe several species of shorebirds.You can also observe several species of shorebirds.There have been occasional reports at this site of Orcas (Orcinus orca) feeding on sea lions. There have been occasional reports at this site of Orcas (Orcinus orca).Degree of difficulty: easy, Duration approximately 1 hour, Dinner in the evening. pleasurable experience. The Opuntiacactus grow here too and the vegetation changes color according to the season of the year. Paths: easy, duration: 2 Hours. Lunch at noon. PM: Cerro Brujo: Wet Landing is a beautiful beach of white coral where you can swim and watch birds and sea lions, plus you can snorkel. Located on the north coast of the San Cristobal Island. In the vicinity of the beach you can see seabirds like blue-footed boobies, Nazca boobies, herons, frigate birds and shore birds. Degree of difficulty: easy, Duration approximately 2 hours, Dinner in the evening. Day 5 TUESDAY: San Cristobal – Interpretation Center and TOT AM: Interpretation Center-San Cristobal:Breakfast in the morning.Dry Landing. 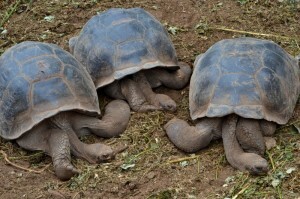 This site is educational information about the evolution of the Galapagos Islands and animal life in the islands. Degree of difficulty: easy. Duration: 1 hour 30Minutes. Transfer out to San Cristobal’s Airport. * Film and more film or enough flash memory to download pictures. * Binoculars in case you want to get a more detailed look at unique animals in Galapagos. * Pepto Bismol or Kaopectate for stomach upset and mild diarrhea. First you must fly into contiental Ecuador to either Quito or Guayaquil; There are several commercial flights arriving into Ecuador everyday. The most efficient way to get to the Galapagos from mainlaind Ecuador is by air. Your Galapagos flight booking is guaranteed with your cruise confirmation. All international connections are from mainland Ecuador . There are flights from Quito with a stop over in Guayaquil, and from Guayaquil to Baltra or San Cristobal where your cruise will begin. Your flight will take 30 minutes to get from Quito to Guayaquil and about one and a half hours from Guayaquil to Galápagos – Baltra or San Cristobal . What does my cruise rate include? Lodging on board in a cabin with private facilities; All meals, water, coffee and tea; All excursions as mentioned in the itinerary (itinerary subject to change) with English speaking naturalist guide; Shared shuttle transfer to Quito or Guayaquil airport *only departure transfer (included only if the Galapagos flight has been booked through us on our scheduled departure cruise dates); All transfers in Galapagos (airport-yacht-airport transfers are only guaranteed if the flight has been booked through us); Snorkeling gear (masks, flippers and snorkel) and use of kayaks at designated sites. 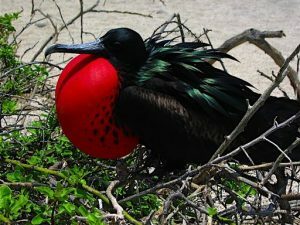 Roundtrip flight to Galapagos Islands; Galapagos National Park entrance fee (USD 100 pp, subject to change); Transit Control Card (USD 20 pp, subject to change); Airport transfers in Galapagos (only included if the Galapagos flight has been booked through us on the scheduled cruise dates. * If your arrival/departure is different than our scheduled cruise flights, the shuttle service is not included); Wetsuit rental; Soft and alcoholic drinks; Tips; Travel insurance and other items of personal nature. Can I pay the Galapagos National Park fee with my credit card or travel checks? Unfortunately the payment can only be done in cash. Where does my entrance fee go? The Park entry fee collected upon a visitor’s arrival to Galapagos is used to help fund Park management and community and conservation projects in the islands. The beneficiaries are as follows: Galapagos National Park Service (40%), Municipal Governments (20%), the Galapagos Provincial Board (10%), Galapagos Marine Reserve (5%), the National System for Protected Areas (5%), the National Galapagos Institute (10%), the Quarantine and Inspection System (5%), and the Ecuadorian Navy (5%). Is the cruise itinerary subject to change? 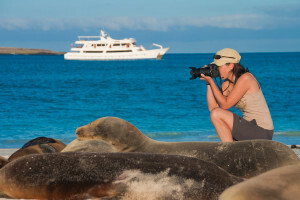 On occasions, the ship’s captain may find it necessary to vary the itinerary due to Galapagos National Park regulations or for safety reasons. What are the land visits like? Most visits last one hour and half to three hours. They are in our small boats or pangas, and either are dry or wet landings. A guide will be always with you frequently making stops to explain or show things, the pace is gentle and never rushed. Cancellations up to 61 days prior to departure, 20% of the total amount paid will be retained as a penalty fee. 60 or less days prior to departure 100% of the total tour rate is forfeited. Incidental expenses on board can be paid in cash US Dollars. We recommend that you book your trip at least 6 months prior to your planned date of departure and 12 months prior to booking for holiday seasons. Do I cruise between islands in the daytime or at night? Is the air ticket fare included? No, it is not included, but we can issue the tickets. The airfare is subject to change; we will provide you with the rate the moment you book. Domestic airline regulations permit 20 kilos per person for your luggage not including small carry-on flight bags. Ecuador is in the Eastern Time Zone (GMT-5 in the mainland). Galapagos is one hour behind mainland Ecuador. How long does the flight from Quito or Guayaquil take to Galapagos? 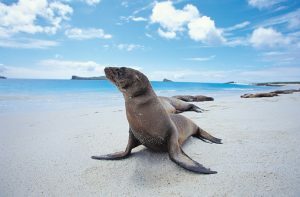 Does Galapagos Odyssey offer special food if I have any food restriction? Yes, in case you require vegetarian food or special meal please let us know at least 6 weeks in advance so we can take care of it. What is the physical condition required the cruise? Elderly or disabled people may have problems in the difficult trails. We recommend that passengers be in reasonably good physical condition as some trails are difficult to pass through. Will I encounter rough seas or bad weather? Due to strong currents, there will be moderate movement of the vessel while navigating. Most passengers are not affected, however, if you are prone to seasickness we recommend you to bring some type of medication to prevent motion sickness. What is the best season to take the cruise? No matter what time of year you visit the islands, you will always find wildlife activity. During the “hot” season the islands are generally much greener and the land birds most active. 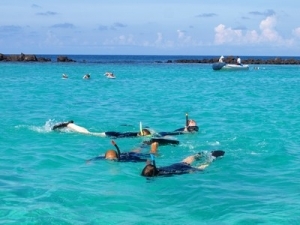 It is also during this period that the ocean temperature is warmer for swimming and snorkeling. During the “cool” season the sea birds and sea mammals are most active. This is the best time for observing courtship displays in the sea birds.